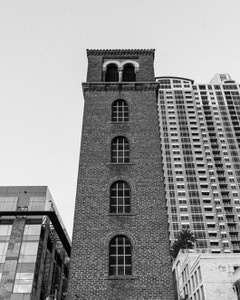 The Buford Tower is a story of overcoming obsolesce and growing pains in Austin’s endeavor of expansion. The structure was built as a fire drill tower in the 30’s and was used for such until high-rise buildings began to overtake the Austin’s downtown proper. New taller buildings and new firetruck technology rendered this five-story test-site a less than ideal training scenario for a modern world. The tower was repurposed as a bellower, saved from destruction by the builder's widow, and the classic architecture can be seen in this shot juxtaposed against an ever evolving Austin skyline.